Soaking in a bathtub relaxes your mind, body and soul. There are plenty of health benefits of taking a dip in the bathtub but with an unlimited number of choices, choosing the right one is actually one hell of a task. Whether it’s ceramic, wood, copper or stone, there is a range of materials you can choose from to make bathing an exotic experience. With the rising popularity of stone home décor, many of you might possibly be thinking of giving it a chance. 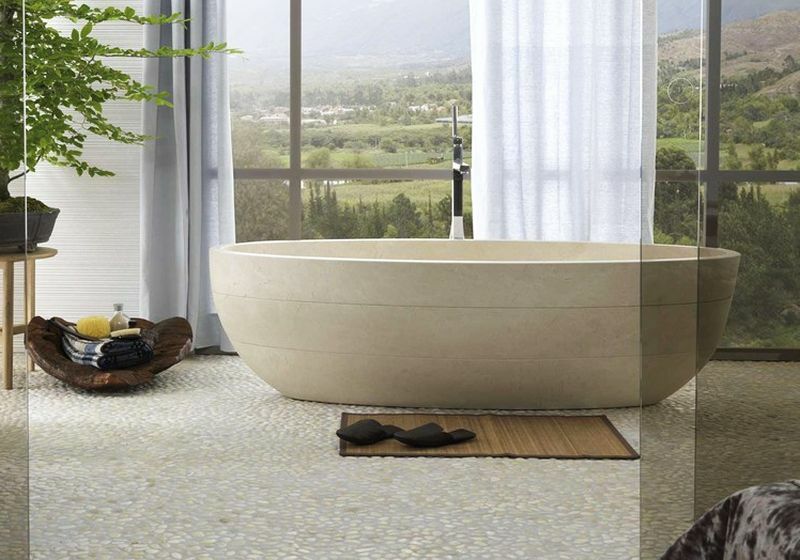 Installing a stone bathtub is a great way to add longevity, luxury, and a natural appeal to your bathroom. 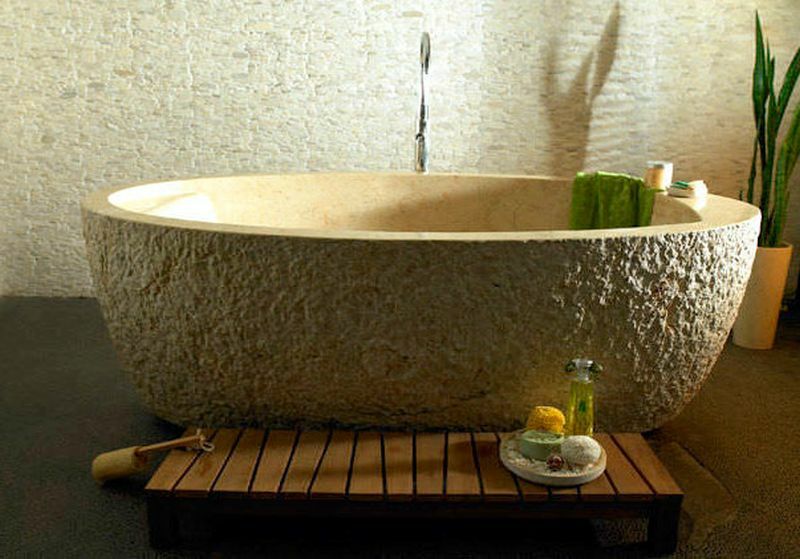 Here is a collection of some of the best and famous stone bathtub designs that offer functionality, beauty, class, and ingenuity to bring a professional spa-like experience to your home. 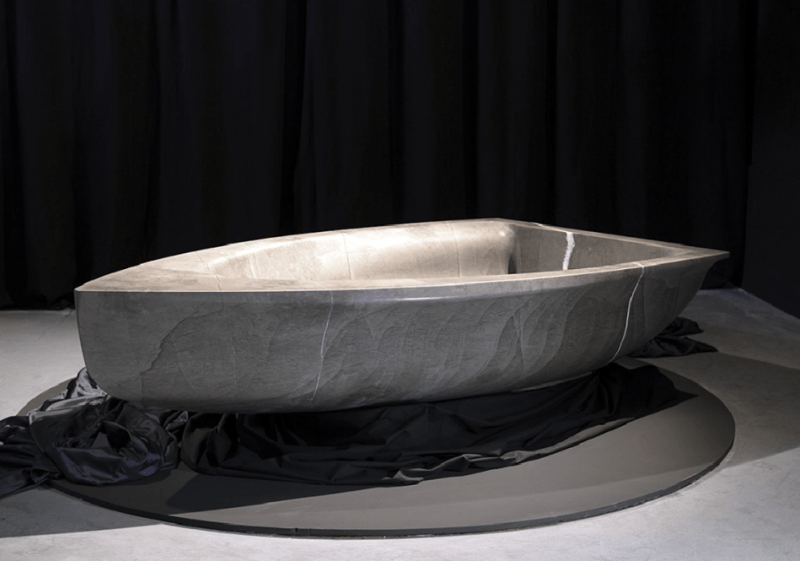 Crafted out of a huge piece of grey marble, Vascabarca is a limited-edition bathtub designed by the French artists Anne and Patrick Poirier for the famous Italian bathroom brand Antonio Lupi. 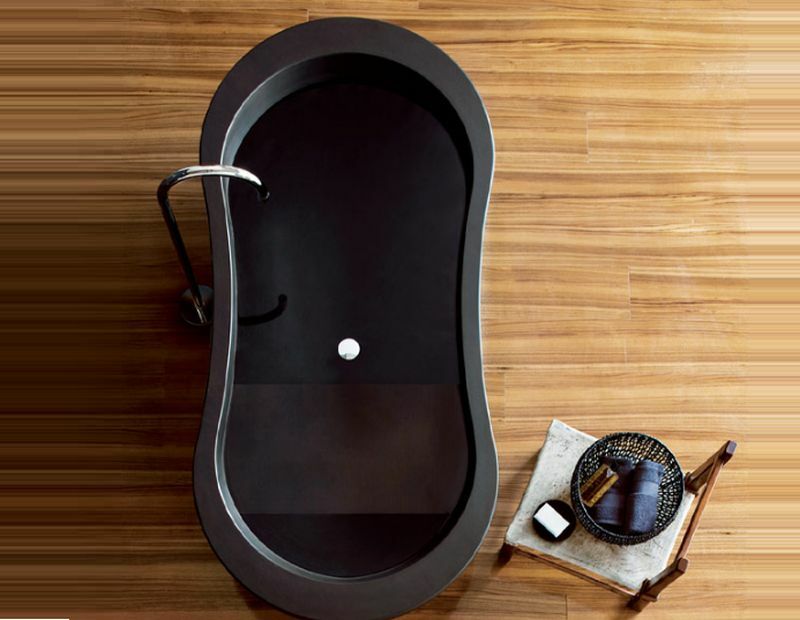 Weighing about 600 kg, this bathtub is a great choice for modern bathrooms, thanks to its unique design. Furthermore, each bathtub is signed and numbered in Roman numerals by the designer duo. Designed by Stone Forest, the Papillon bathtub is a perfect choice to elevate your bathroom decor. 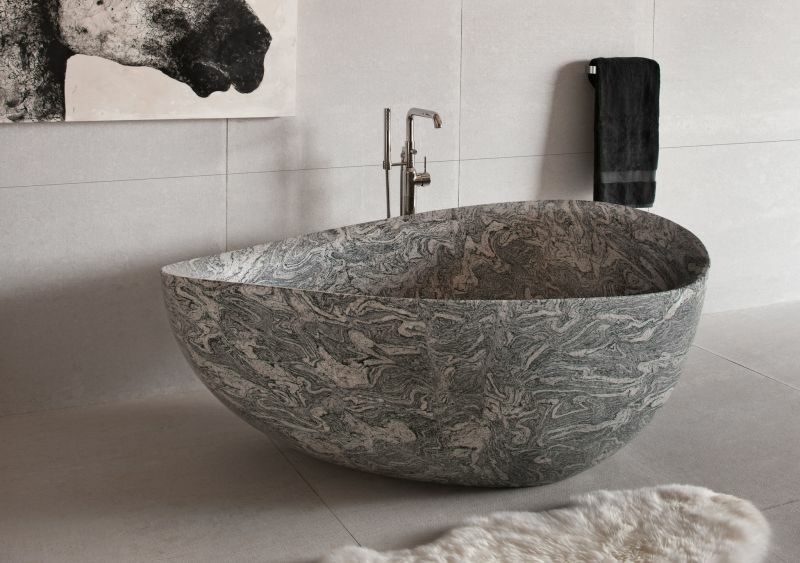 Made from granite, this bathtub features a hemispherical shape and elegant marble patterns, perfect to add unmatched character to any bathroom. Other than its pleasing appearance, you’re also going to love its relaxing shape. Also Read: Stone vs Wood Bathtub: Which one is Better? 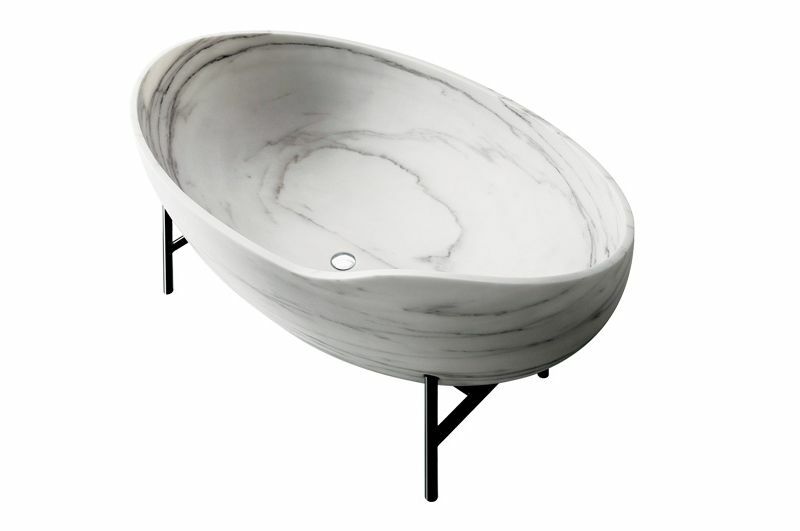 Crafted for elegance and organic simplicity, Kora is a cool marble bathtub designed by Enzo Berti for Kreoo. 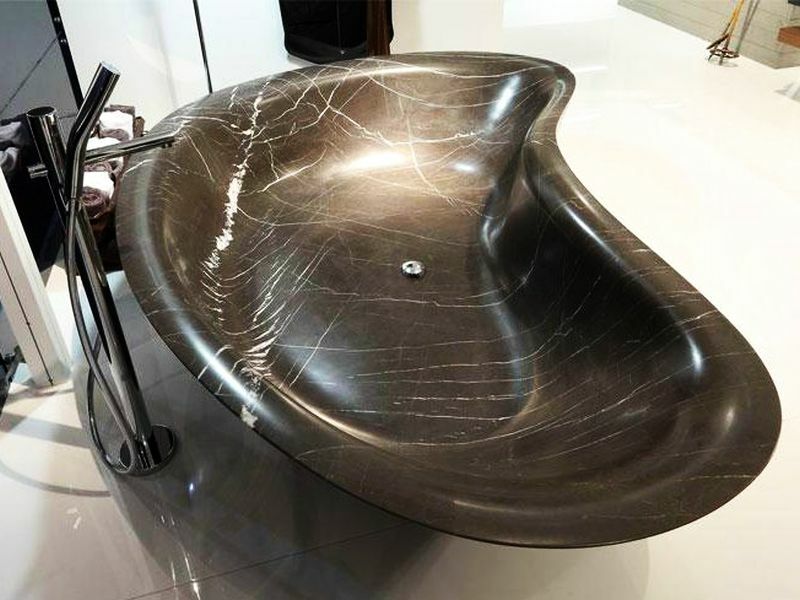 It is sculpted so intricately that it doesn’t show any joints, lines, and marks on the body; rather has black patterns that look like veins and go well with all types of bathroom styles. Sitting on a black metal base, it looks like floating in midair. This one by Henry Timi features a one-of-a-kind design. It looks broken at first sight but actually, it isn’t. With uneven patterns on its base, it adds spectacular charm and functionality to any bathroom. The rough design on one side mimics the uneven rocky surface which justifies its name. 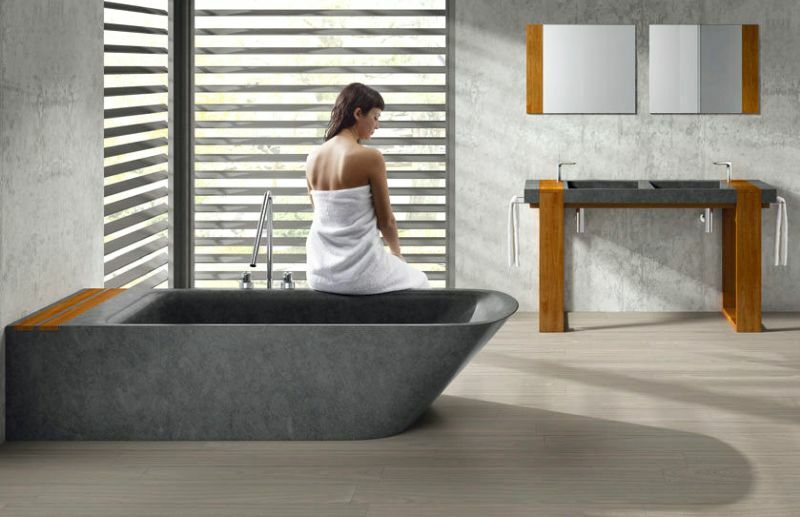 Designed for a large bathroom, this low profile stone bathtub from Vaselli is characterized by its round form and warm appearance. Its over-sized design provides enough space for two people to bathe at the same time and relax comfortably on backrests. It is indeed a stunning example of form and function. 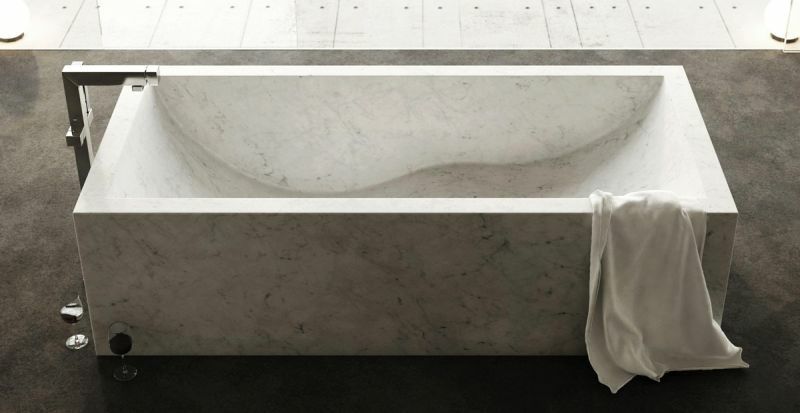 Clean lines and curved design define this cool fixed stone bathtub from Batcho. These bathtub designs are quite comfortable and good-looking, rather than being a simple square piece of stone. The darker tones of marble offer an elegant look that instantly merges with the existing décor of any bathroom. 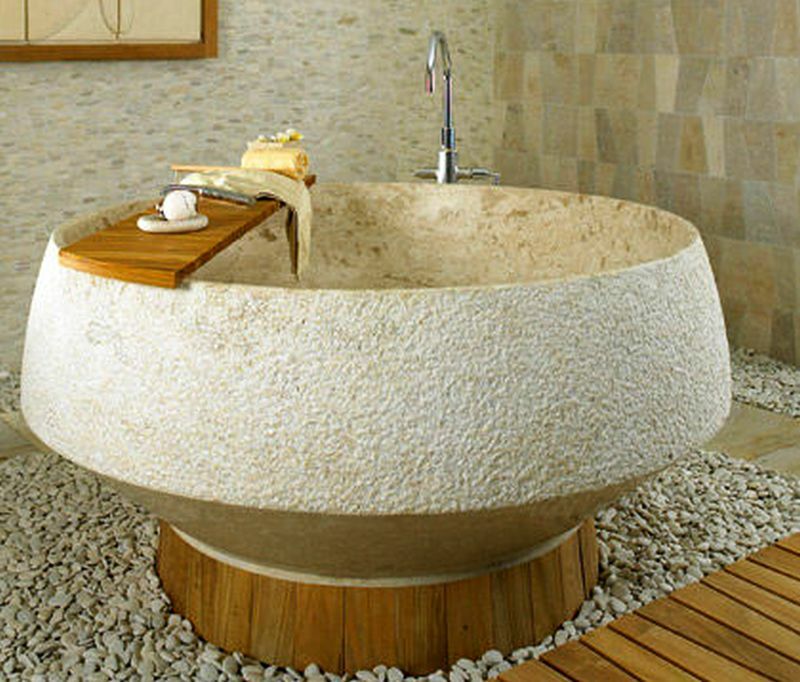 The oval shape of this freestanding stone bathtub is what makes it different from others. It creates a striking silhouette with its refined shape, elevated base, and polished structure. 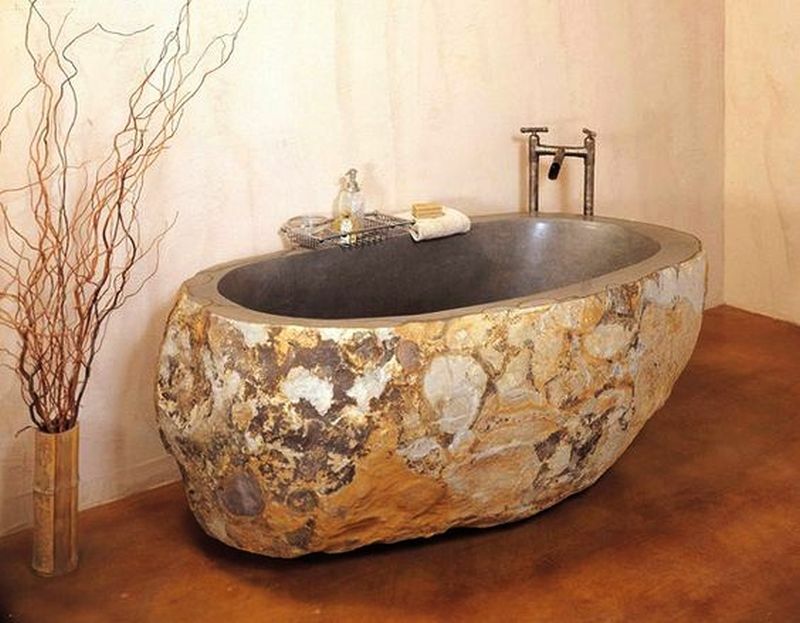 The stone used to craft this bathtub is naturally hardwearing, stain-resistant and smooth. It is a thoughtful choice for those wanting utmost comfort and luxury under one roof. 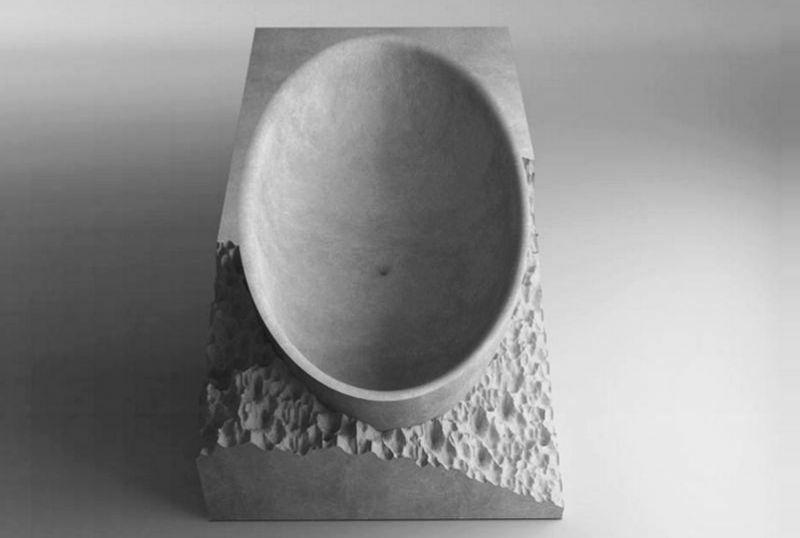 The uniquely-shaped Ovum marble bathtub is a mesmerizing creation from the collective team of Archizero, Michele Cazzani, Tony Matijas and Paolo Rivolta for Franchi Umberto Marmi. Its slightly tilted design looks comforting and beautiful. Despite being carved out of hard natural stone, the egg shape symbolizes the perfection of craftsmanship. 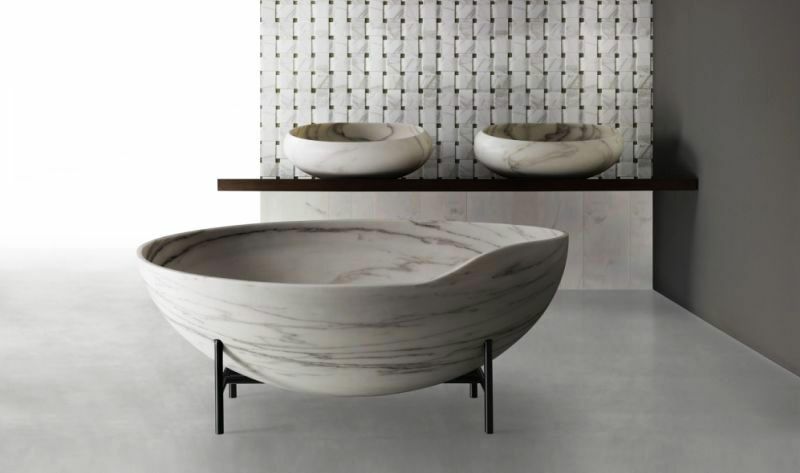 Designed by famous architect Naghi Habib for Italian brand Falper, Level 45 is a freestanding marble bathtub. The exceptionally unique arc shape, emphasized by a matt surface offers an elegant and sophisticated look, making it perfect for modern bathrooms. 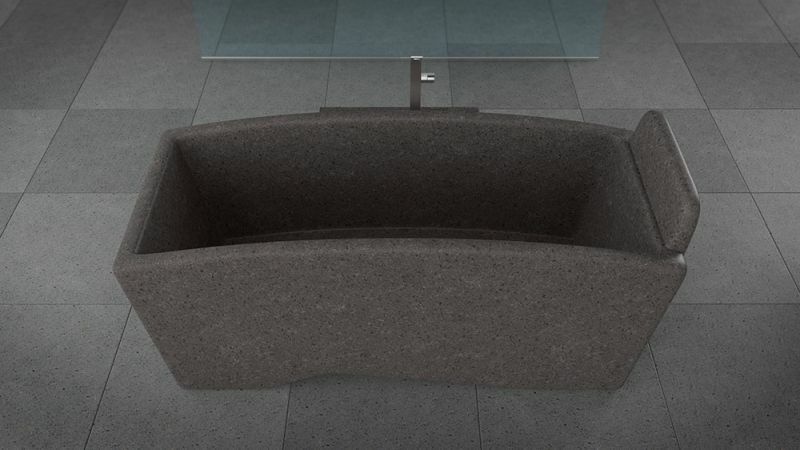 The space-saving design of the Level 45 stone bathtub is ideal for homeowners having small bathrooms. 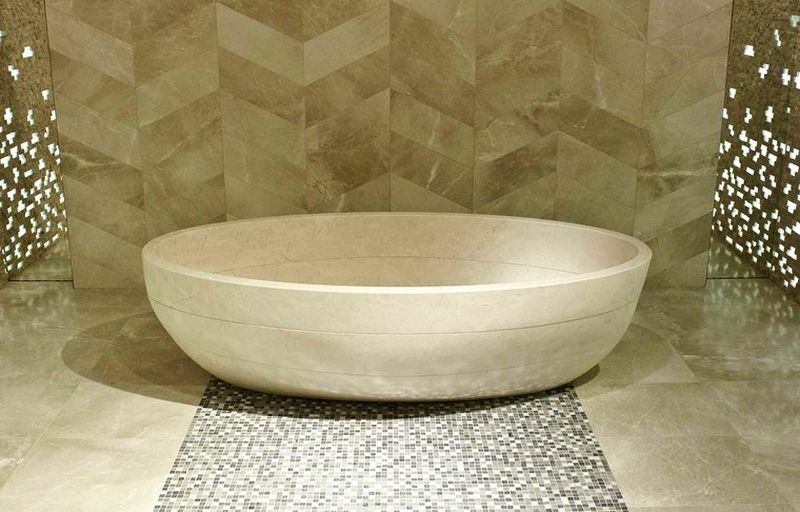 Roma is a graceful oval-shaped stone tub from D’Vontz. 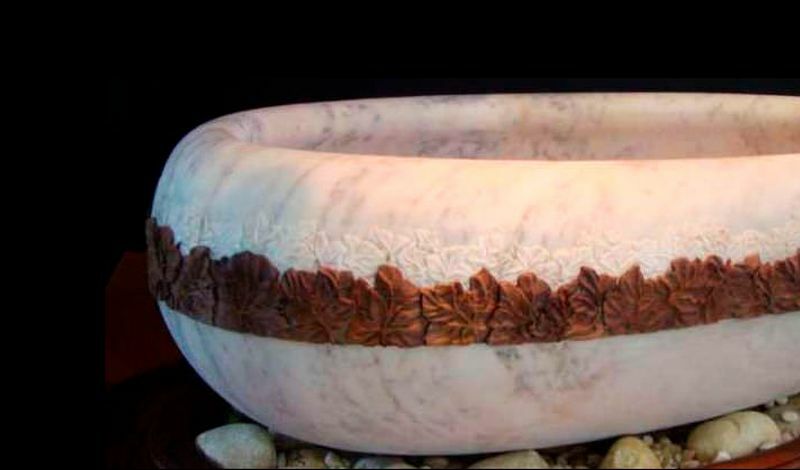 The two colors of natural stones add depth to the tub and make it a striking piece of art. High sides with armrests ensure comfort, while four different choices of natural stone offer personalized options for better suitability. 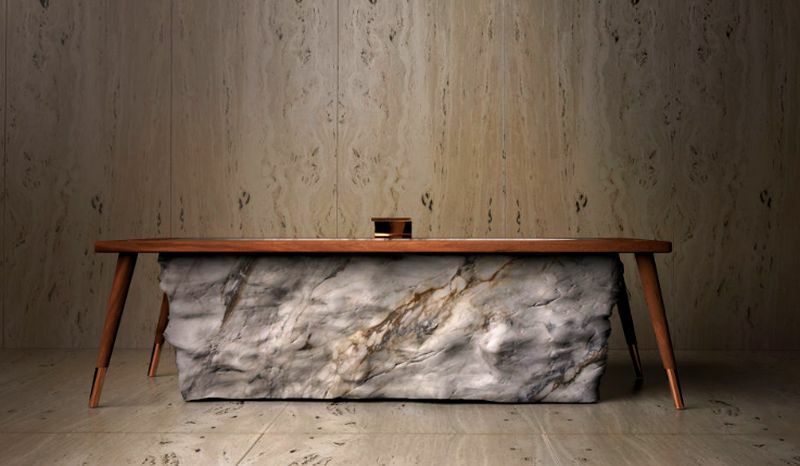 This is one of the most natural-looking stone bathtubs you’ll ever come across. 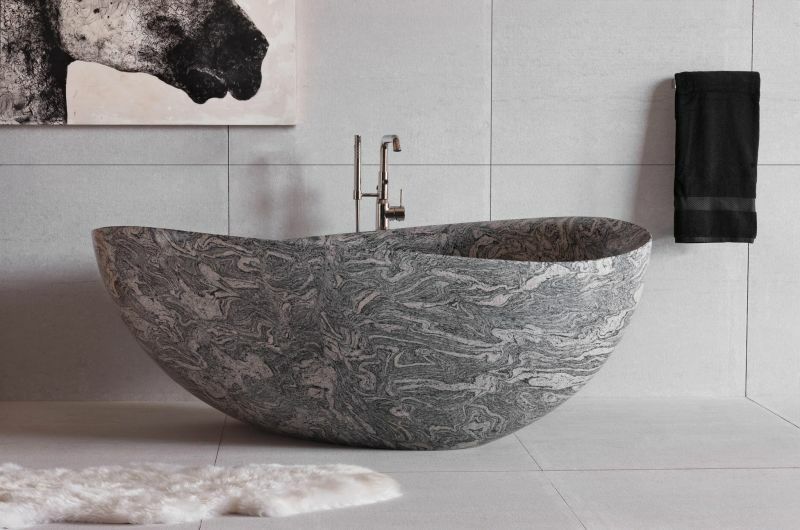 Handcrafted out of a single large black stone, this bathtub is a unique mixture of modern and natural elements, making it perfect for anyone craving to bring a piece of nature within their bathroom. The rugged appeal and natural appearance add primitive flair to a bathroom while delivering an experience of riverside bathing. 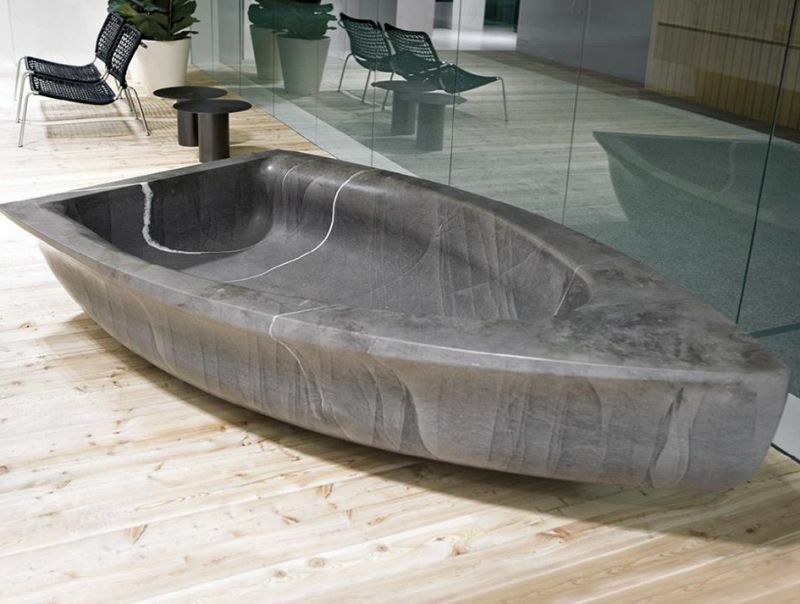 Piedra Boat is a freestanding marble bathtub from WS Bath Collections. Measuring 75L x 48W x 21.7-23.6H inch, it is ideal for small bathrooms. 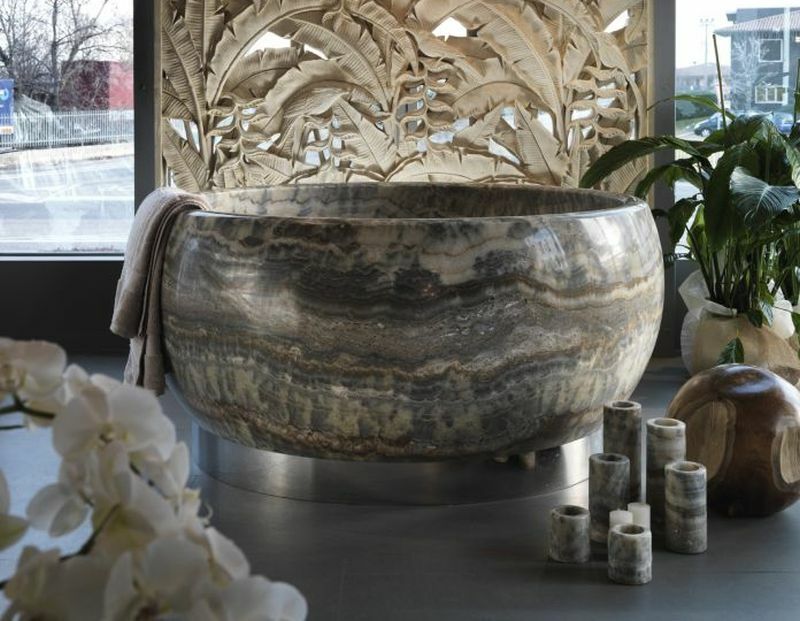 Extremely modern and elegant, this stone tub is a one-of-a-kind addition to any bathroom. It boasts a delightful color and veining throughout the surface. This earthy bathtub from IL Marmo’s Fusion collection is ideal for those wanting a combination of shower and bathtub in one. There are options to buy a single tub, shower, or a combination of both. 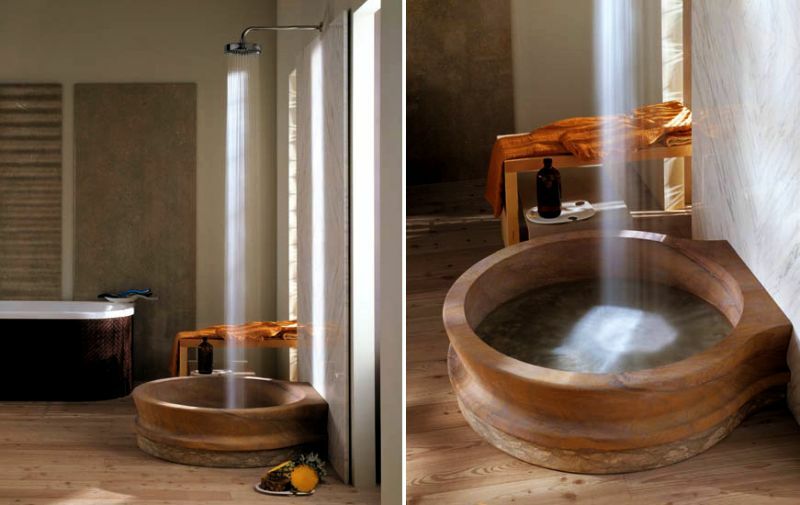 The warm tones of this bathtub are mesmerizing and suitable for infusing new life into a boring bathroom. Made in an appealing oval shape using natural stone, Samara Bioprot bathtub is designed by L’Antic Colonial, a Spanish brand famous for working with natural materials. 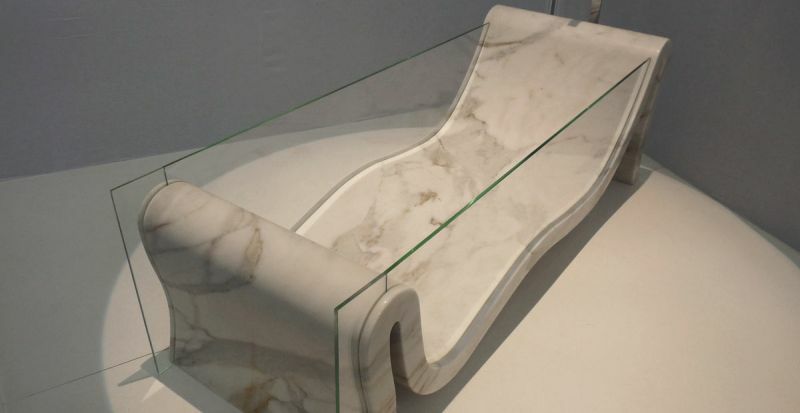 It appears to be made from three slices of a bathtub. The elegant colors and patterns of natural stone create a relaxing experience. Organic finish and grains ensure bathroom remodeling is done right. 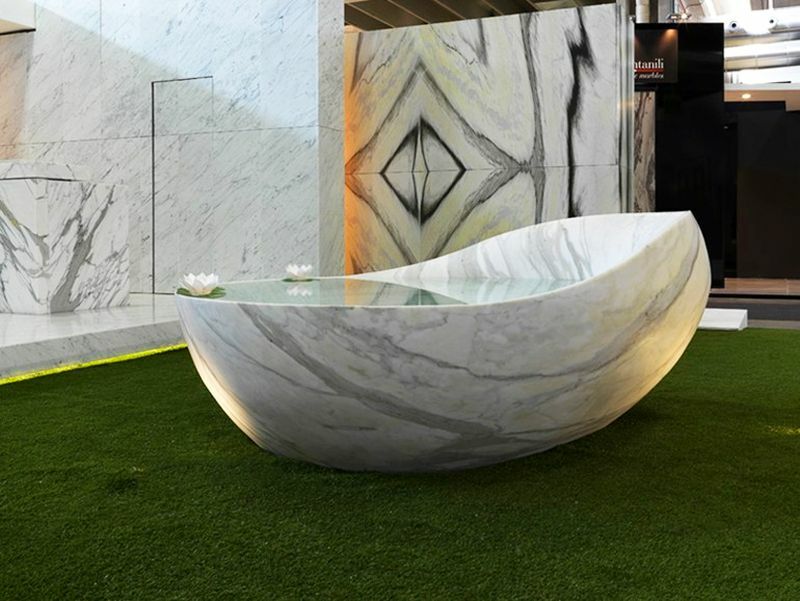 Crafted from a monolithic piece of white marble, it is a square shaped bathtub from Dedalo Stone. Due to its chaise longue-like profile, it can be installed as a freestanding isle. On both short sides of the hydromassage bathtub, there are two marble panels fixed with the help of magnets, which can be removed to inspect the built-in hydraulic system. 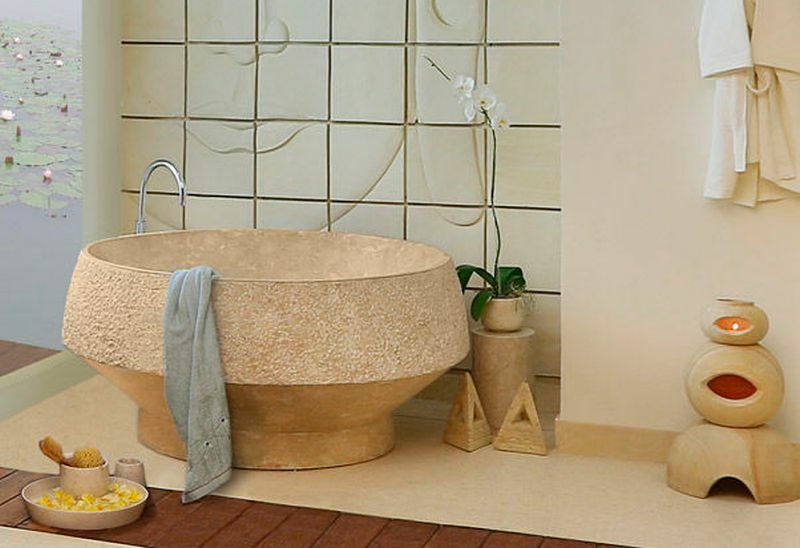 It is a designer bathtub that can add class and feel of natural stones to the bathroom. Bring in a modish appeal to your bathroom with Pfeiffer designer bathtub made by combining Calacatta marble with wood. 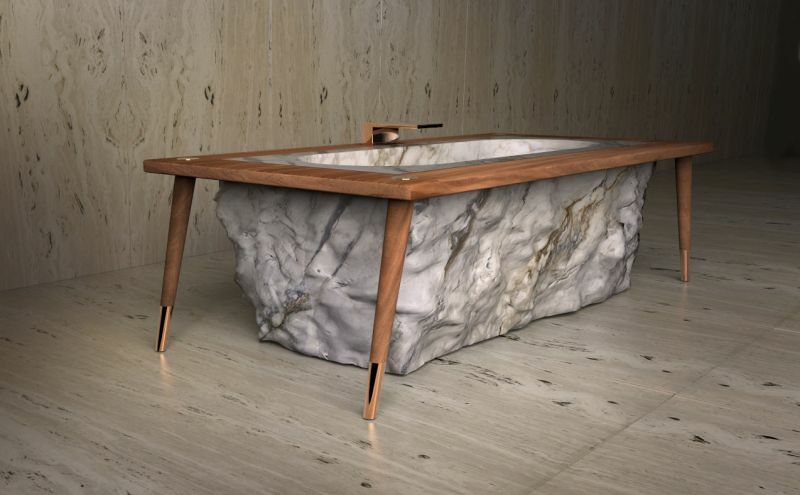 Designed by Cláudia Verde, it looks like a large rugged piece of rock, coupled with a wooden frame to function as a soaking tub. 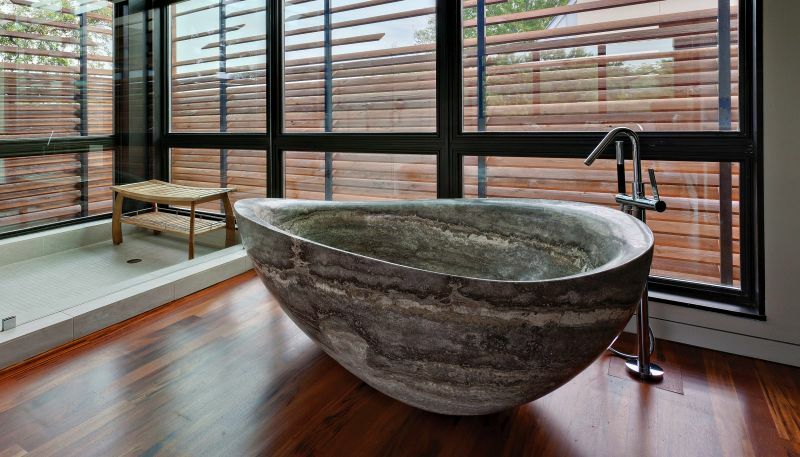 The rough, imperfect look of marble adds a rustic character of this tub. 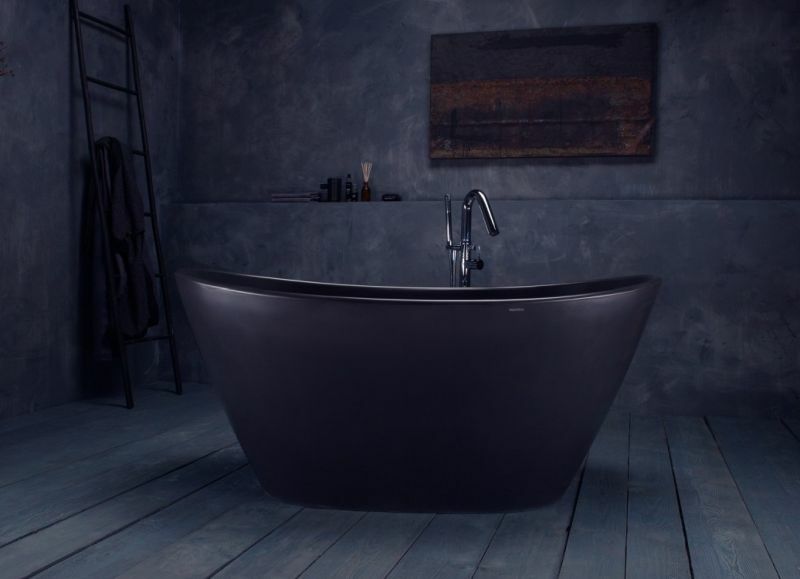 If you’re dreaming to incorporate some black essence into your bathroom, you should absolutely consider this freestanding stone bathtub made of award-winning composite AquateX. The solid, matte surface of the material presents a silky and velvety texture, which is very pleasant to touch. Coupled with ergonomic design, it’s ideal for an ultimate relaxation at home. 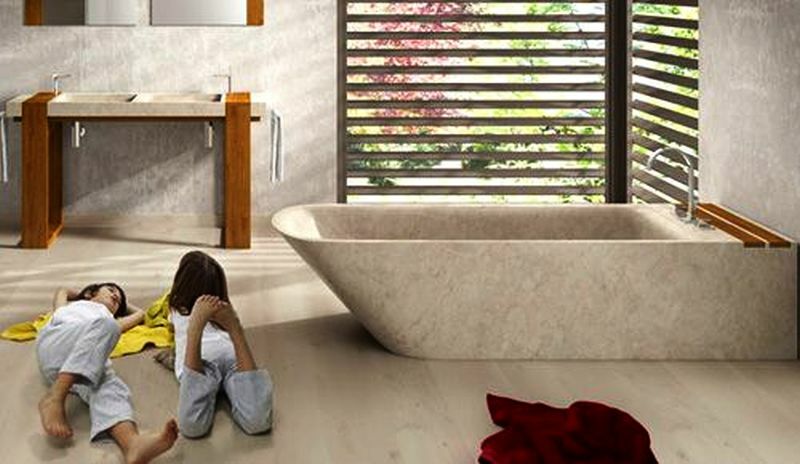 Created by Indonesian company Bati Bali, Naga bathtub is made from beige marble. 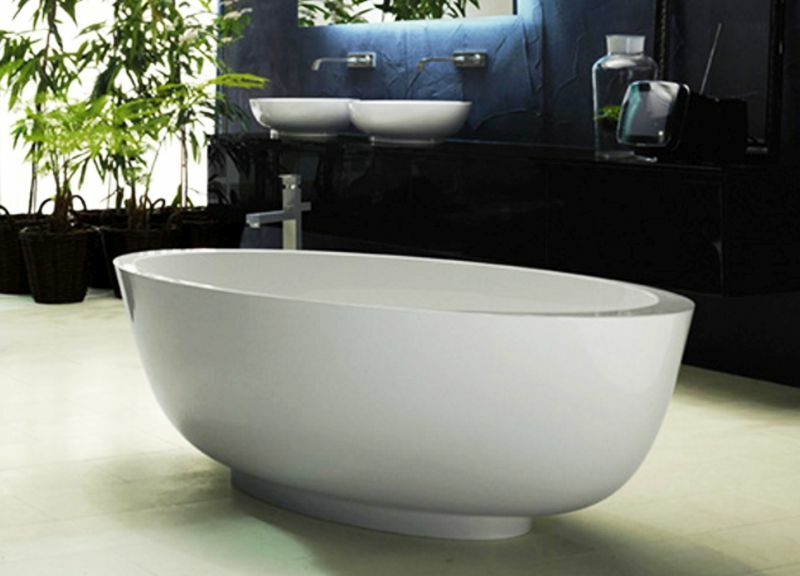 The uneven surface of this oval-shaped bathtub makes a modern statement in any bath. There’s also an option to include a teak wood footstep. Edges of the tub are wide enough to keep important stuff within reach. 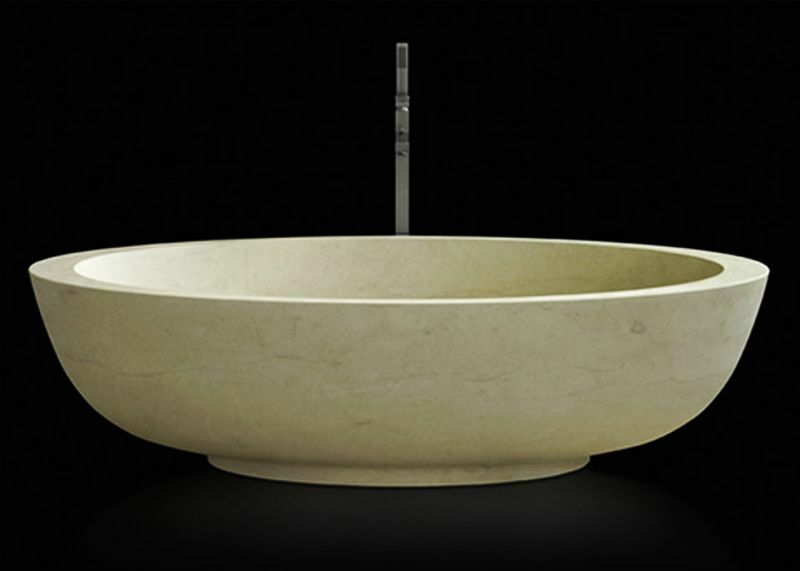 Made from white marble, it features a fine oval profile to match different bathroom interiors. 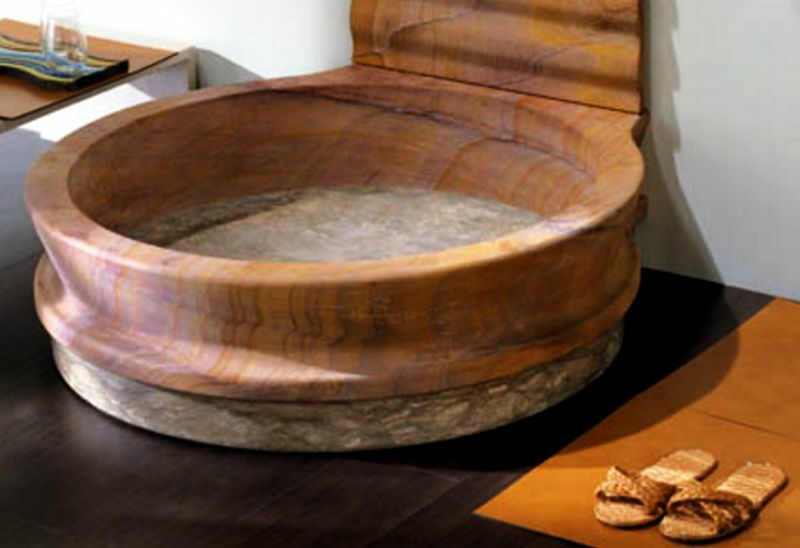 Standing on a wooden base filled with river rocks, this donut-shaped bathtub by Roca is a cool addition to any bathroom. 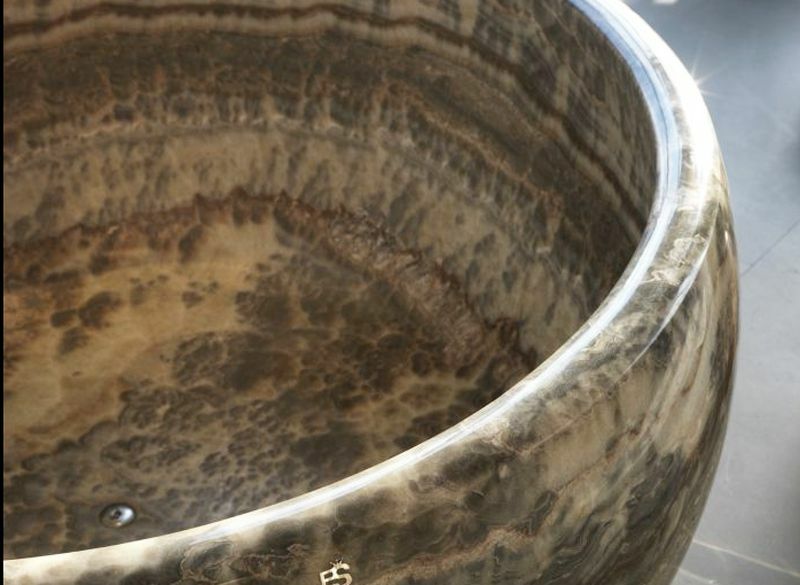 Sitting on a shining metal base, it is a solid block of grey bubble onyx crafted into a freestanding bathtub that exhibits fine craftsmanship. The circular shape and clean lines are ideal to add some color and texture to your bathroom. 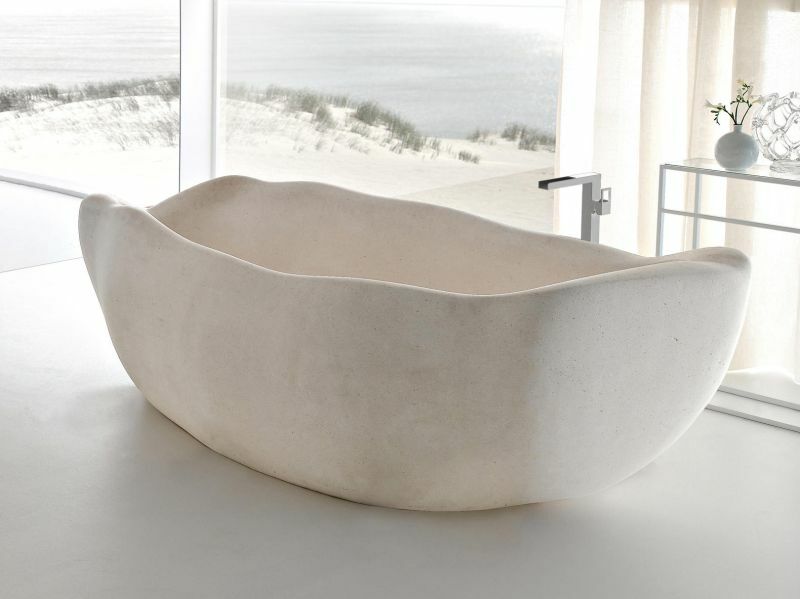 Kama Deva bathtub is designed by the Indonesian interior designer Marina Pandunata of Bati Bali from beige marble. Measuring 1400 x 1400 x 700 mm, this bathtub features an elegant conical form, matched with a wooden base to infuse a romantic spirit into your bathroom. There’s also an optional footstep and wooden amenity tray for more convenience in keeping bathing essentials within reach. Featuring clean lines, curved back, and a large alcove, Onsen is a modern take on classic rectangular bathtubs by Rodolfo Dordoni. 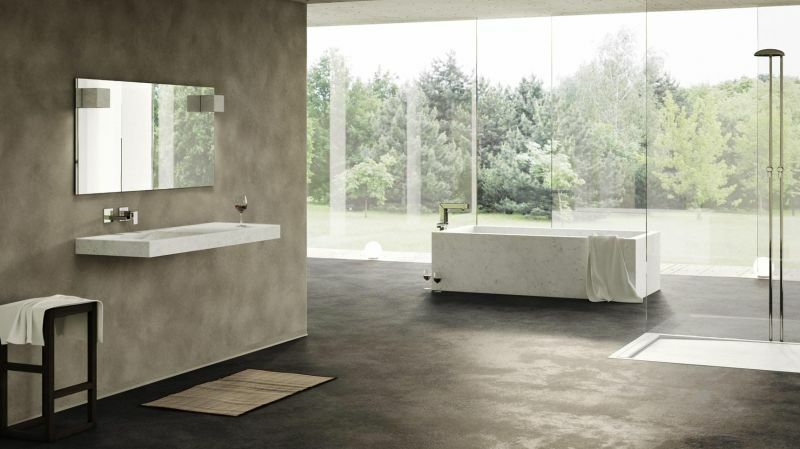 Designed for Salvatori, the bathtub is available in Bianco Carrara, Crema d’Orcia, Pietra d’Avola and Silk Georgette. It is designed to function as a center of wellbeing in a home. 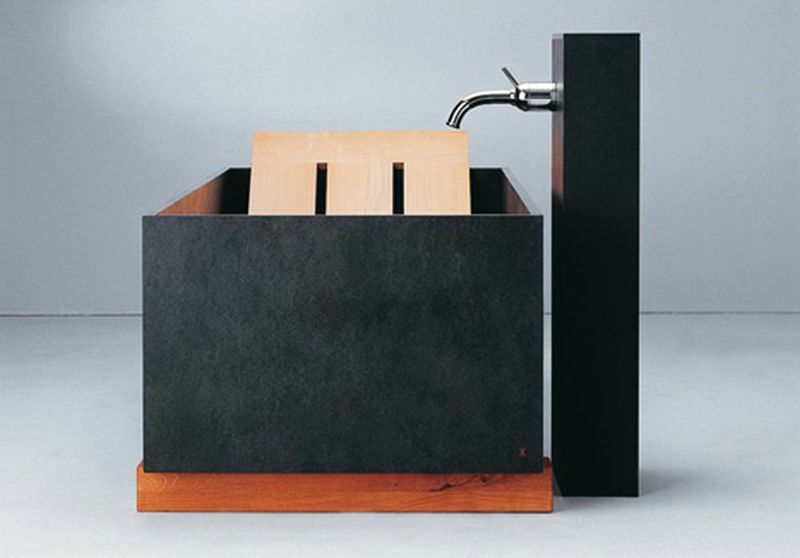 Designed by Spallo Kolb for Max Frei AG (Maxim), this rectangular tub is made from black slate, an ideal material for those who fall for dark themed decor. 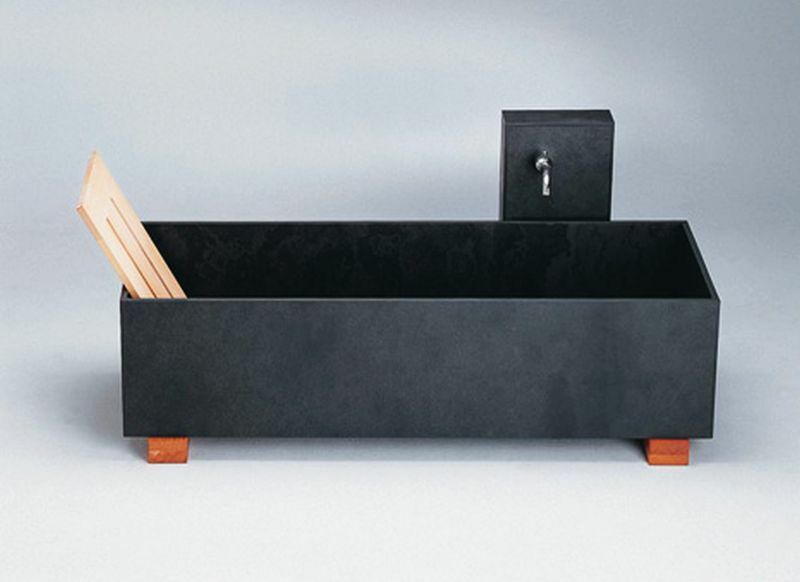 This black slate bathtub is slightly raised from the floor with two wooden beams, giving it a special form of lightness, despite the alleged heaviness of the material. There’s also a wooden backrest that can be used in different positions to enhance comfort and bathing experience. 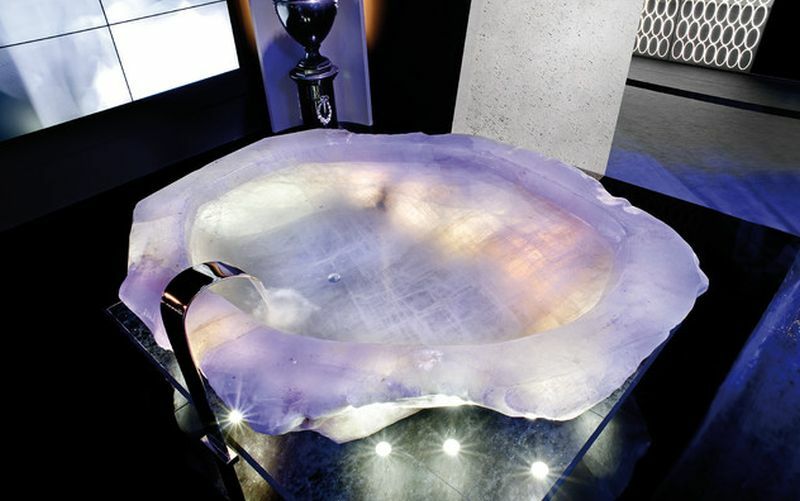 This sparkling bathtub is crafted from a single block of rock crystal weighing over 10,000 kg found in the Amazonian rainforest. The outer surface is left rough to show the unhindered natural beauty of the rock crystal. 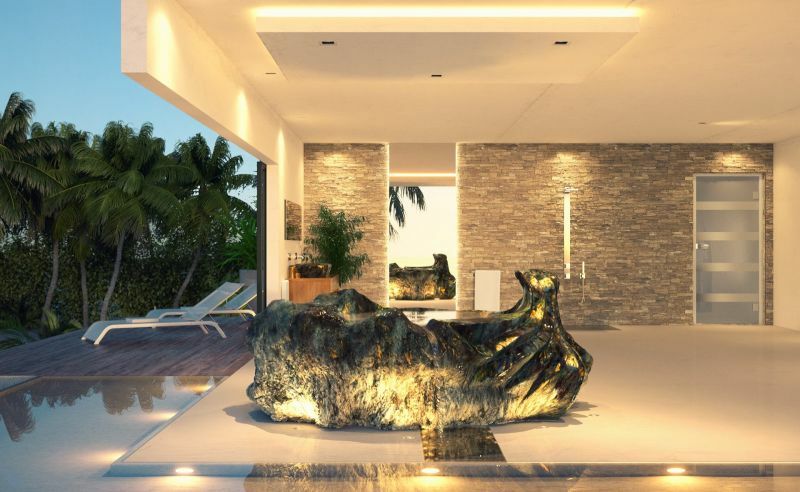 By integrating lights in its surroundings, it becomes a shimmering gemstone. 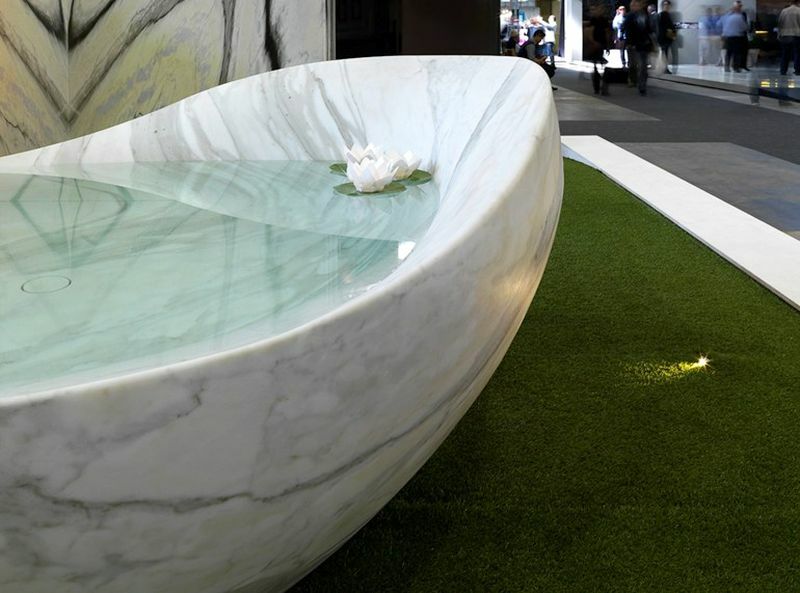 Perfect to be placed outdoors, it is a bathtub that reminds of riverside stones with rounded edges. 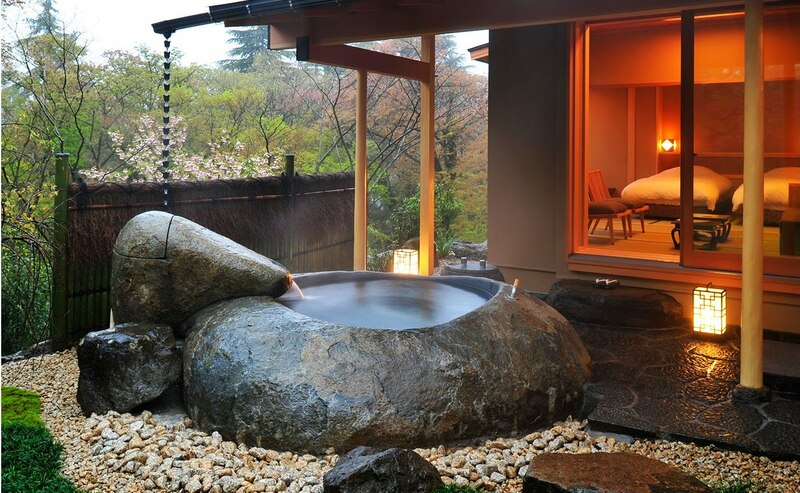 Sitting on a base made from small river stones, it is ideal for people who love being surrounded by nature. If you’ve some idle space in your backyard, it can be a good option to elevate your backyard decor. 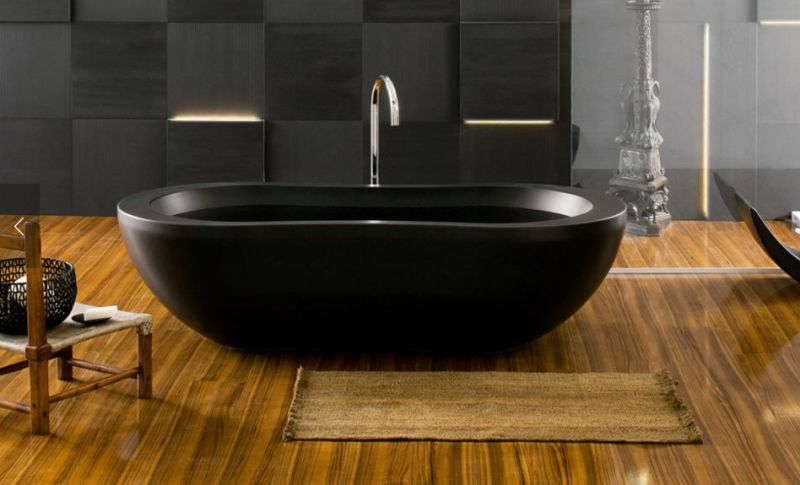 This modern style freestanding bathtub with a glossy finish looks great in a dark-themed bathroom. There are a total of nine different types of stones to choose from. The unique shape of this bathroom fixture enhances the overall appeal of any bathroom. Unlike most bathtubs featuring straight and clean lines, the alcove of this freestanding bathtub is organically shaped like a pearl shell, ensuring comfort on all sides. Its curved silhouette and soft white appearance turn any simplest bathroom into a welcoming space. 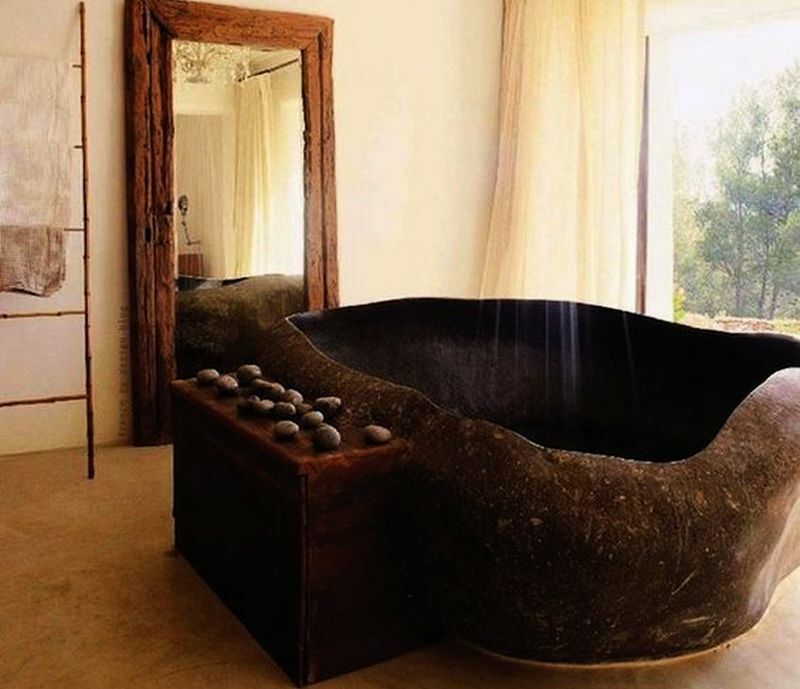 Adding a bathtub heavily inspired by nature can definitely take bathroom decor to new heights. 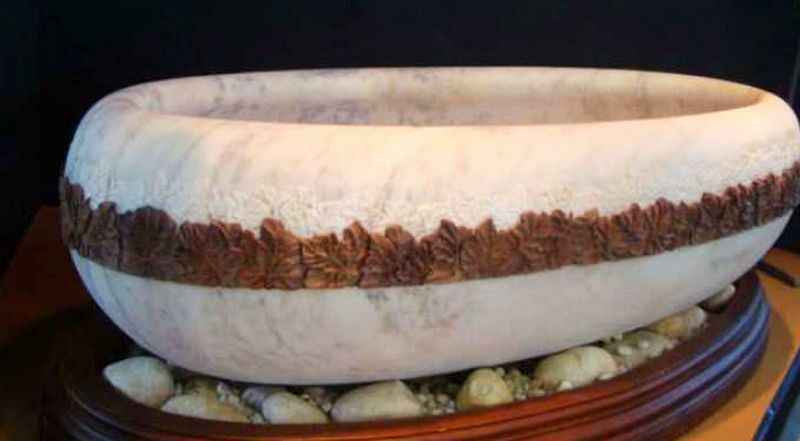 Made from rough beige granite, its outer surface nicely shows-off intricate patterns of natural stone, while alcove is finely finished for a cozy feeling. From outside it looks like a stone, but interiors with clean and sophisticated alcove tell the story of a modern bathtub. 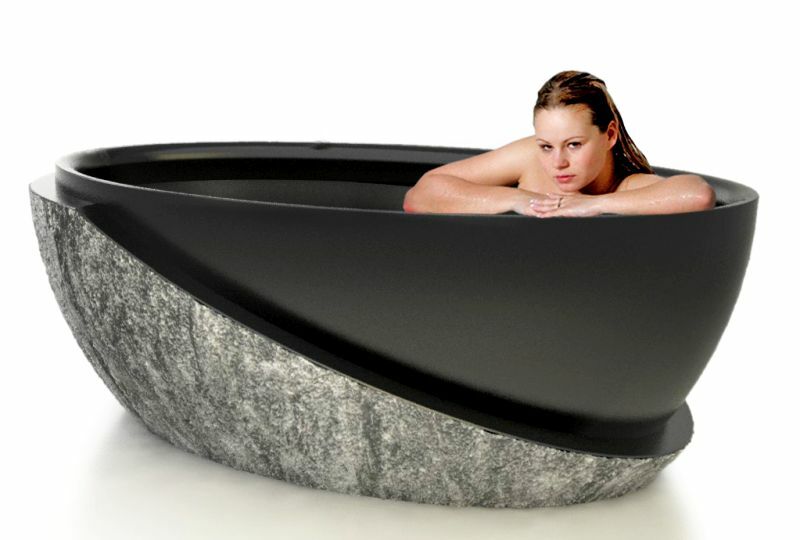 This stunning bathtub is made of a giant black rock found on river banks. 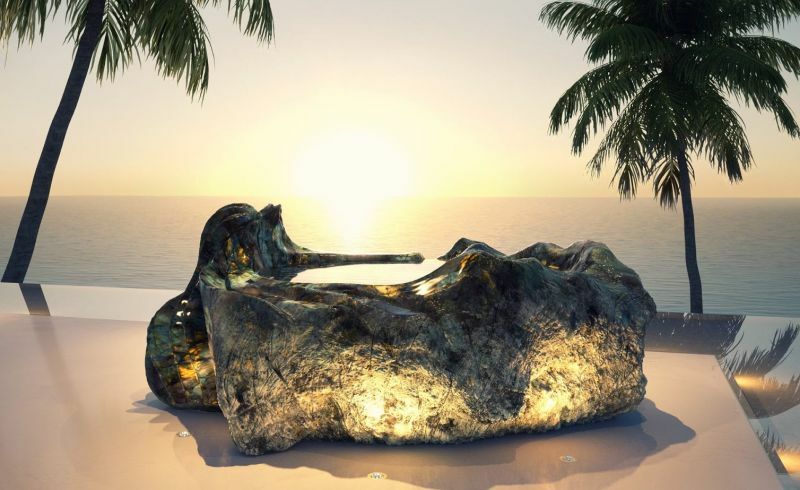 The designer has hollowed the rock to give it the shape of a bathtub. 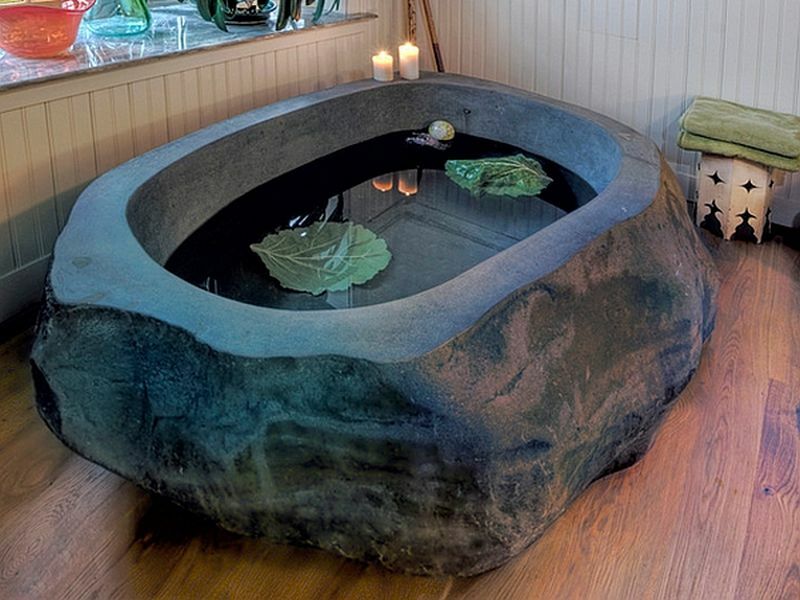 Those who care a little less about details can go for this tub carved out of a giant rock. It will be an attention-grabbing piece whether you place it indoors or outdoors. 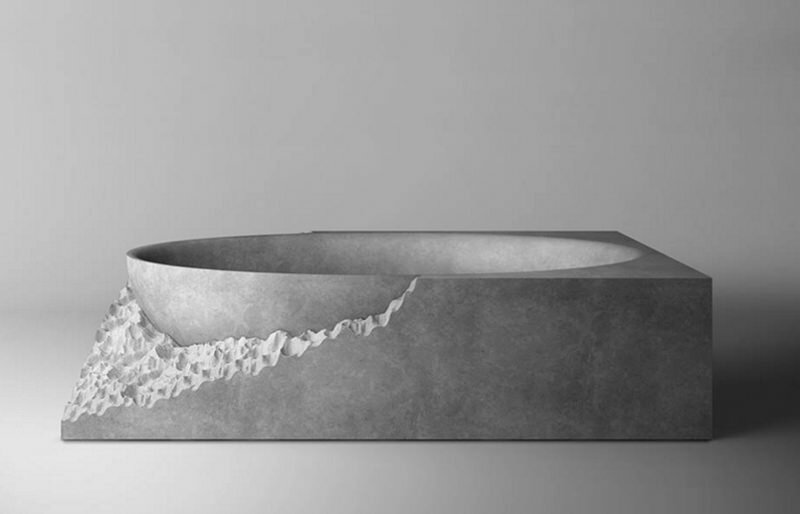 Dedalo Stone’s Hydra bathtub is made from glass and natural stone. With transparent glass on all sides, it brings an element of nothingness to your bathroom. 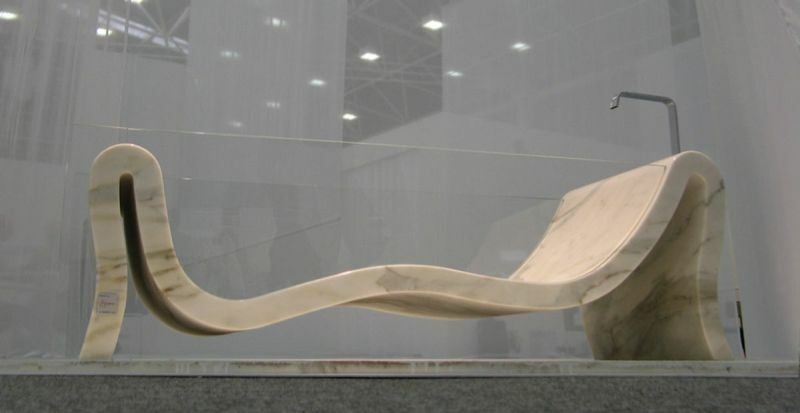 The bathtub gives an impression of a uniquely shaped chaise lounge. 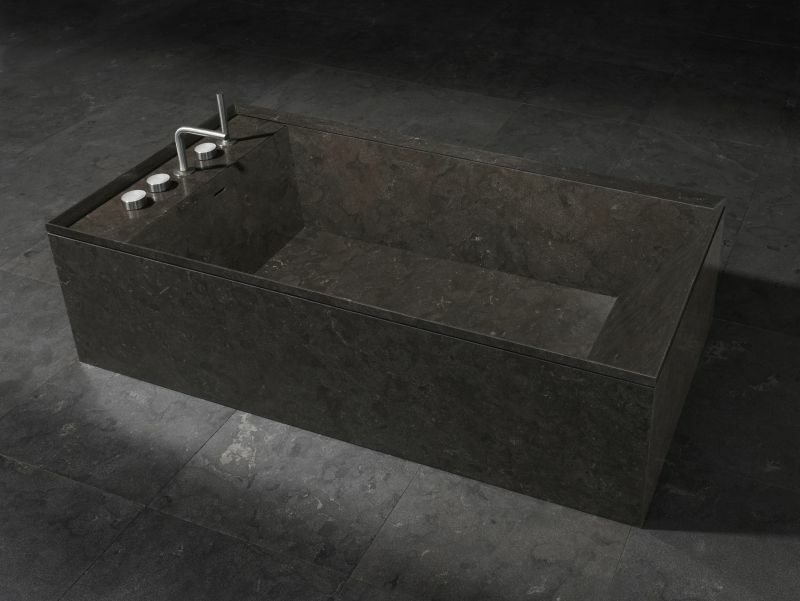 Combining a delightful curved design with warm and welcoming tones of natural brown lava stone, distinguish this tub carved out of a single block of volcanic rock. 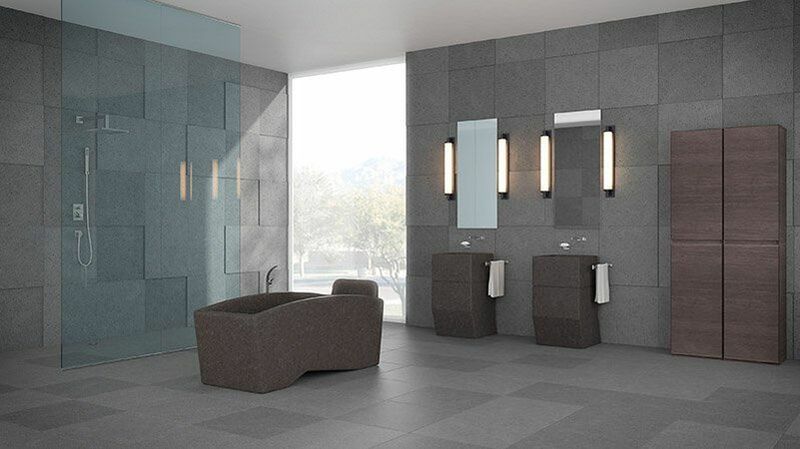 Optimal accuracy in design and finishing make it an element of great value for bathrooms. A built-in headrest offers a relaxing soaking experience. 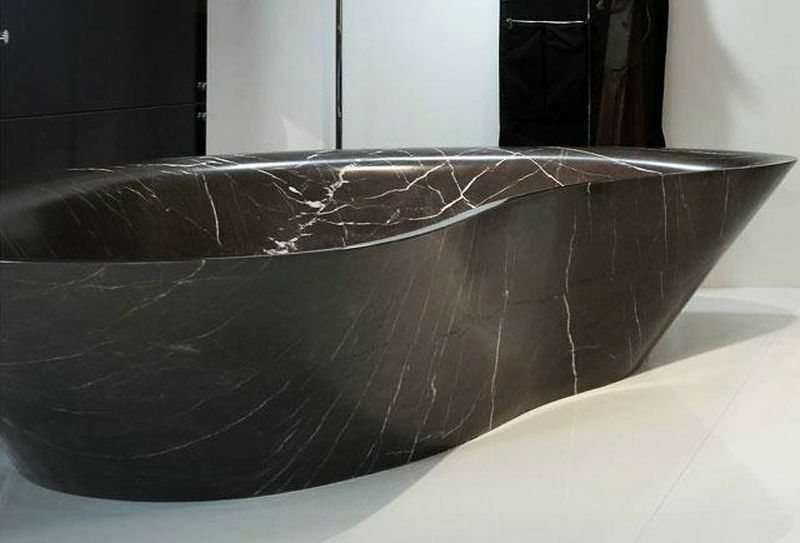 Dutch sculptor Jan-Carel Koster has created this unique, three-person bathtub for GUIDERO Holland B.V. from an 18,000 kg block of Labradorite. The different colors refracting from the bathtub are what makes it a beautiful and functional sculpture for your bathroom.